For the past couple of years, I’ve been wanting to make this recipe! 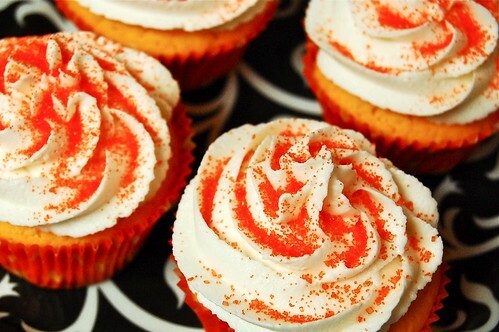 Red velvet cupcakes are so huge, but what about Orange velvet? I’ve never really heard much buzz about them and I was determined to find a recipe to try! I found several great examples…many being from Tennessee! 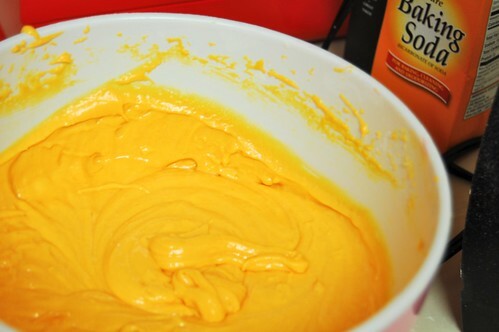 The University of Tennessee colors are orange and white, so a lot of people make orange velvet cake to honor their team! 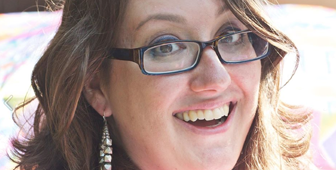 I found this recipe on the Stirring the Pot blog on knoxnews.com in Knoxville. It turned out being a GREAT recipe and when I took it into work today, I got a lot of compliments and I think it will be a recipe you will want to make a Halloween tradition! Beat together softened butter and sugar. 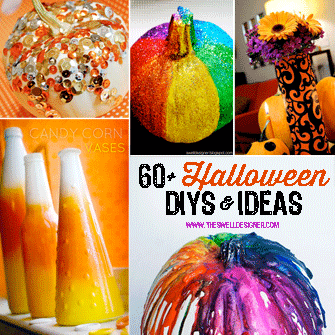 Add food coloring and eggs. Beat well. Add buttermilk, flour, salt, vanilla and orange extract. Mix well. Stir in by spoon the vinegar. When well-blended, add soda. Mix well. I iced using Wilton’s Buttercream Frosting recipe. They turned out really cute and look professional! It’s because I used the 1M tip and got tips from this video! 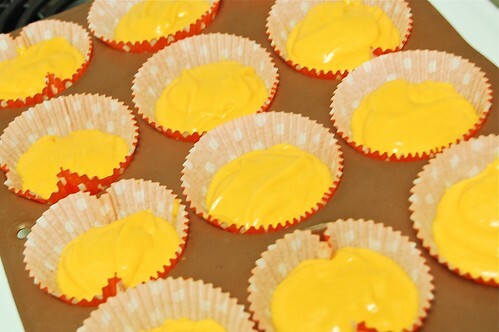 Here’s a few more views of my pretty orange cupcakes! Hope you enjoy this recipe! Until next time Swellions! By “soda”, do you mean Baking Soda or carbonated water? TIA! I measured out the 2 1/2 cups flour and then sifted. I’m a cheat, I only sifted once. 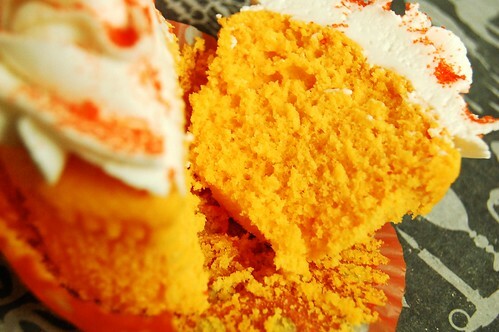 I’ve been looking for cupcake ideas for an upcoming birthday party–I’d never even thought of orange velvet! These look delicious. Thanks for sharing! I’m totally making these for tailgating for the Bama game. And then I’m going to do them again for Halloween!! Totally awesome!! LOVE!! Orange Velvet is cool. I am gong to make this recipe tonight. 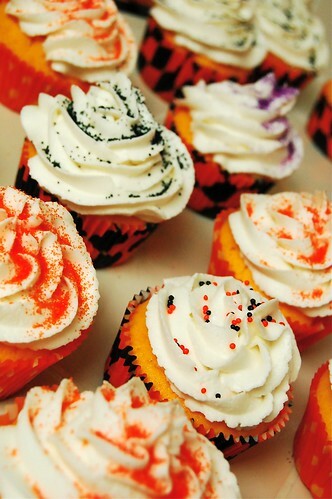 What a great Halloween cupcake recipe. Thiswill be the first tim trying it for me. Thanks for sharing. 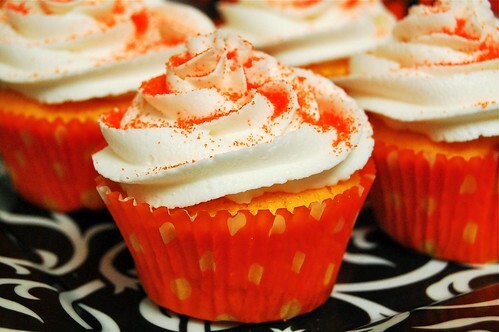 These orange cupcakes look super cool..must give them a try! !